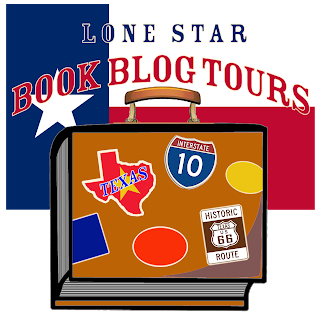 Today I am hosting a BOOK REVIEW as part of the blog tour for CINCO DE MURDER by Rebecca Adler, the third book in A Taste of Texas mystery series. It's fiesta time in Broken Boot, Texas, and tourists are pouring into town faster than free beer at a bull roping for the mouthwatering Cinco de Mayo festivities. Tex-Mex waitress Josie Callahan, her feisty abuela, and even her spunky Chihuahua Lenny are polishing their folklorico dances for Saturday's big parade, while Uncle Eddie is adding his own spicy event to the fiesta menu: Broken Boot's First Annual Charity Chili Cook-off. Although it had been a while since I read the first book, Adler's writing style creates such a casual and welcoming experience that is hard to forget and I was immediately swept back into this endearing locale. 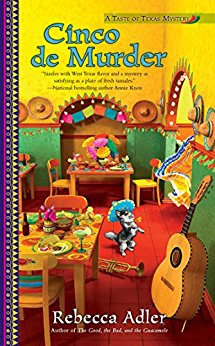 Josie is still so self-deprecating, likeable, and fiesty, and through her narration, she vividly captures this colorful community, while also remaining staunchly loyal to her family. Her journalism background and instincts gives her amateur sleuthing skills authenticity as well as playing on the antagonistic relationship between the media and law enforcement who would much rather she mind her own business on all levels! Lenny, her adorable sidekick, is a chihuahua who sounds the alarm with yips and yaps to get Josie's attention as he aids her in their fight against crime. You'll definitely have cravings for Mexican food while reading, so do yourself a favor and have some chips and salsa with a Dr. Pepper nearby or use the provided recipes to cook up something tasty on your own. Prior to writing women's fiction, Gina always found a way to add a touch of the dramatic to her life: dinner theatre in Mississippi, can-can club in Florida, and playing a giant Furskin in the New York Toy Fair, plus the occasional play and musical. 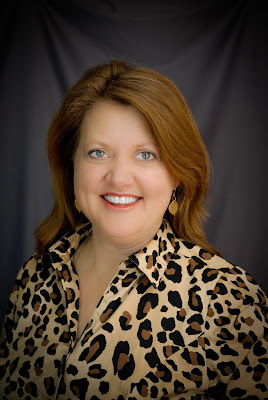 She's currently content to pour her melodramatic tendencies into writing her Taste of Texas culinary mystery series. Set in far West Texas, her humorous stories are filled with delicious suspense and scrumptious Tex-Mex recipes. Her alter ego, Gina Lee Nelson, writes sweet contemporary romances with a sweet, Southern-fried flavor. 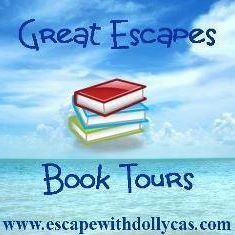 Many thanks to Great Escapes Virtual Book Tours and Rebecca Adler! It was an absolute pleasure reading, reviewing, and hosting. And be sure to check out the other stops on the BLOG TOUR for more opinions and author extras! Thank you for your review and all the information on "Cinco de Murder" by Rebecca Adler as well as being part of the book tour. Enjoyed reading the excerpt and would love the opportunity to read the whole book.